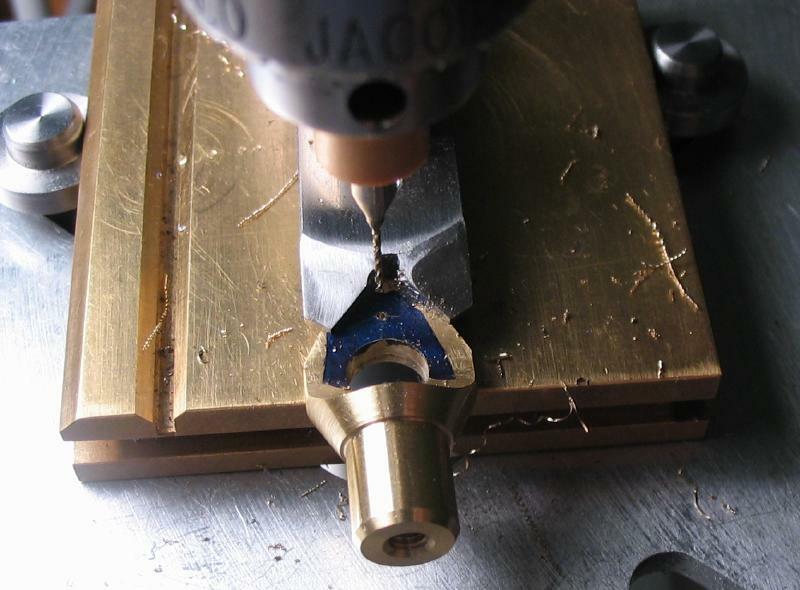 Dogs for center turning are described below. 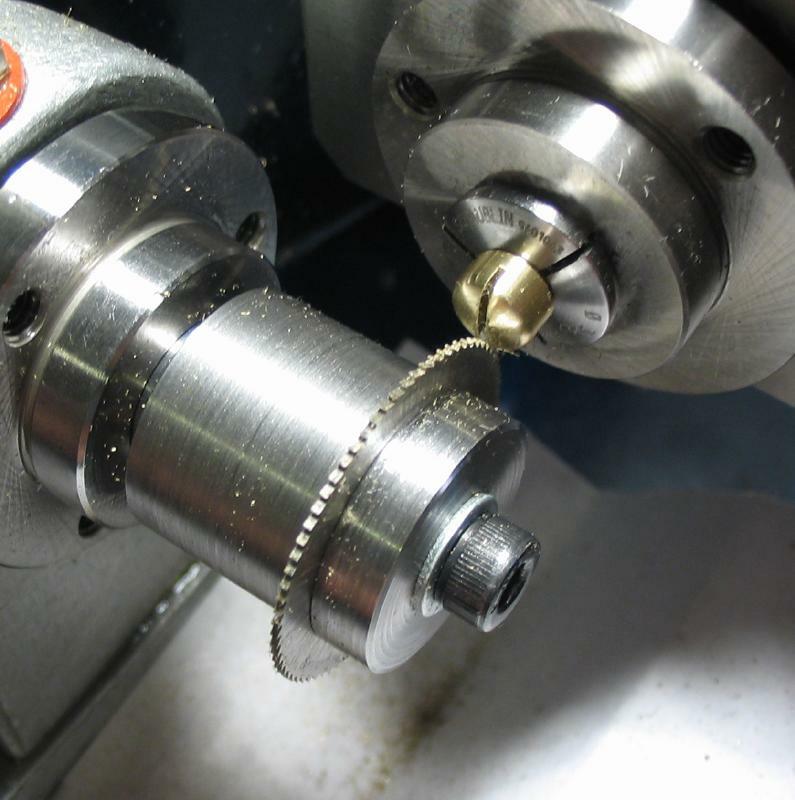 In center turning, the work itself is held between points or cones in the headstock and tailstock and the work it not clamped in a chuck, so the transfer of power to rotate the work is somewhat indirect. 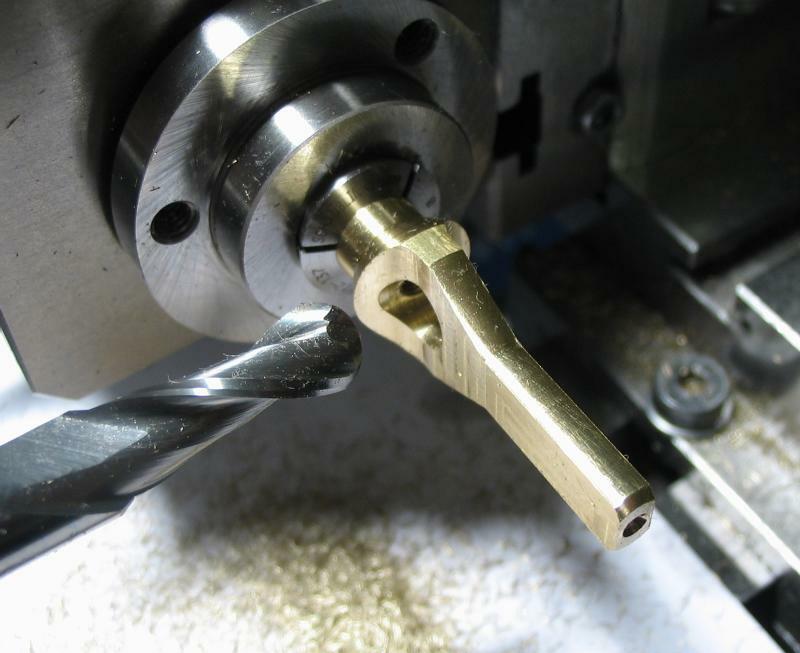 The dog is simply a device that can be attached to the work and is acted on by a protruding pin on the headstock spindle or the dog itself my have a pin the extends into a hole or slot. 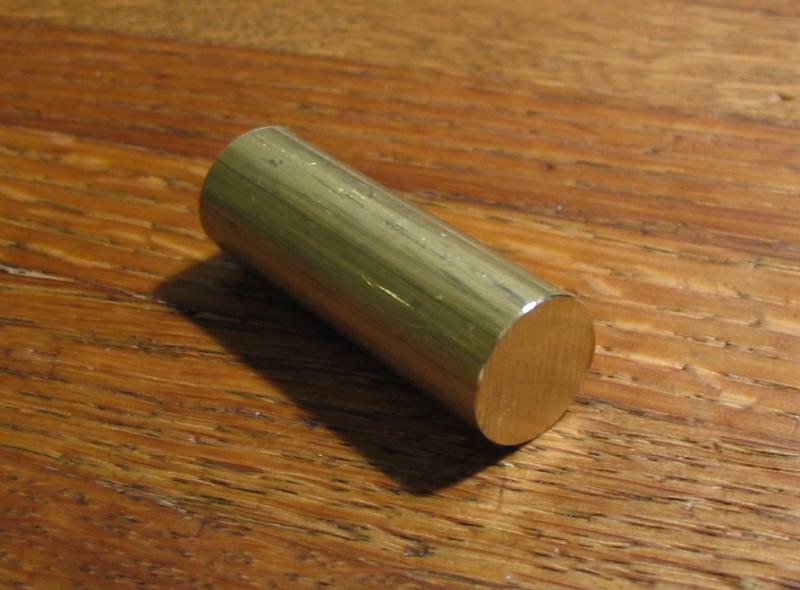 The dogs made below are made of brass and have a screw adjustment for attaching to round work. 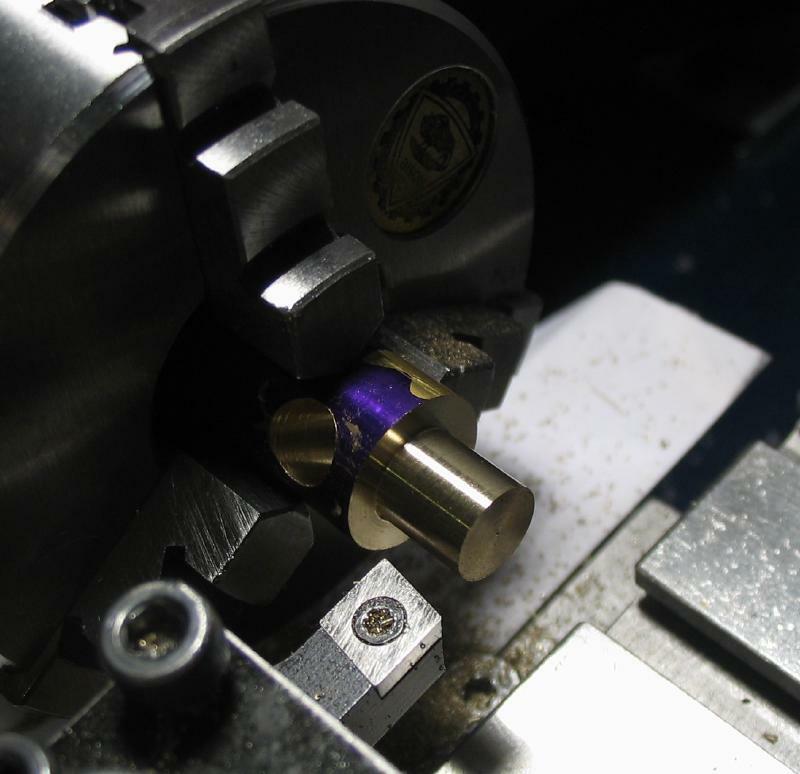 Each dog has a range of diameters that can be accommodated, and I am emulating the style of dog that can be found as a set of differing sizes with watchmaker's lathes. 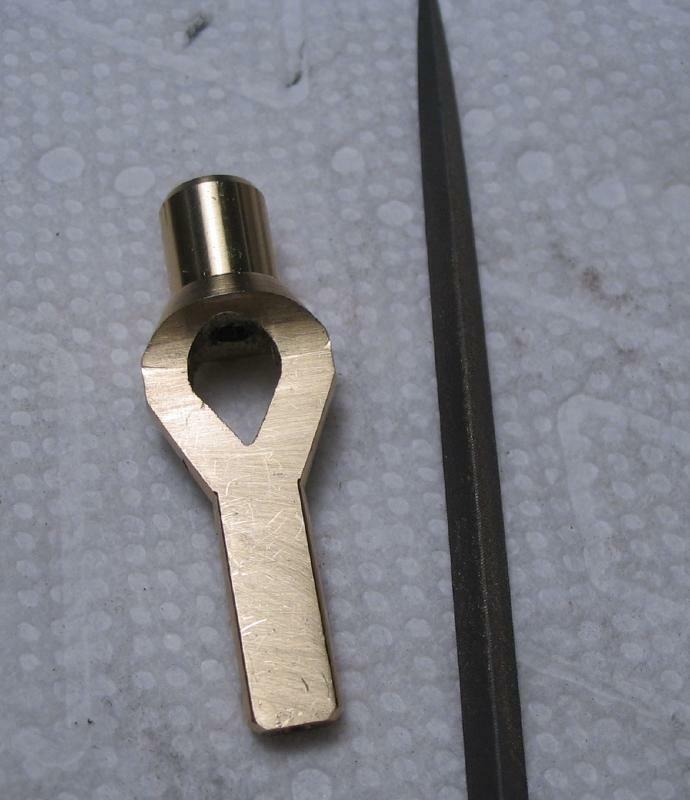 The largest size that I had in mind was started first, and was started from 1/2" brass rod (type 360). 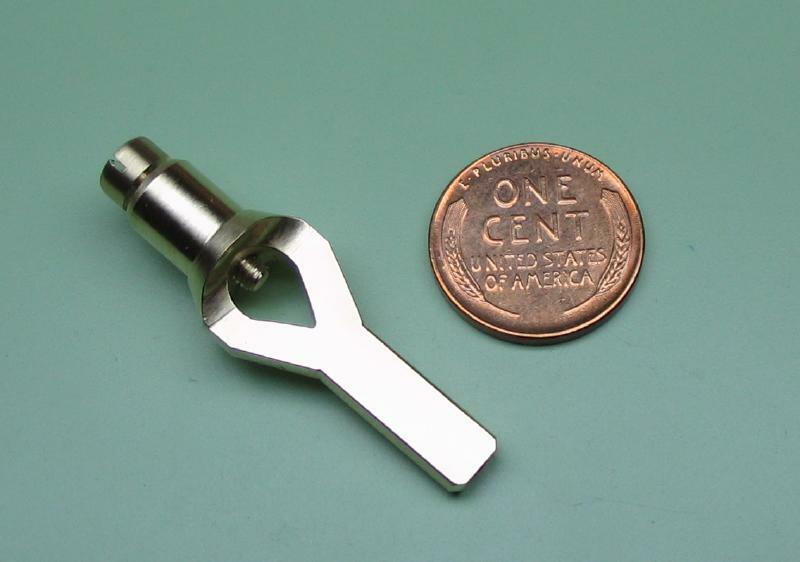 It may be more economical to use bar stock, but a roughly 36mm length of rod was already at hand. 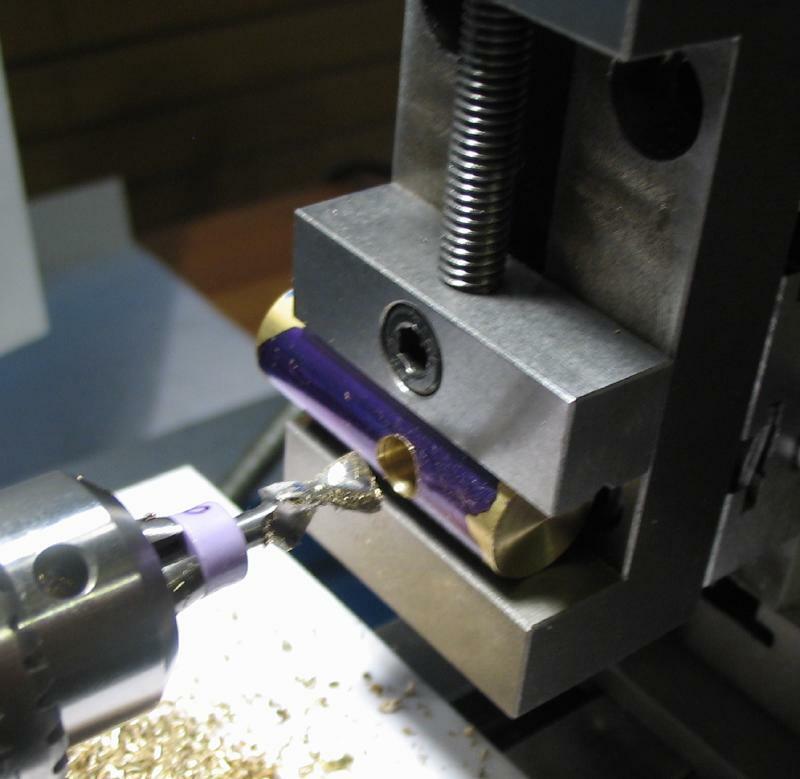 The ends were faced, and the rod then moved to the vise for cross drilling 6mm. 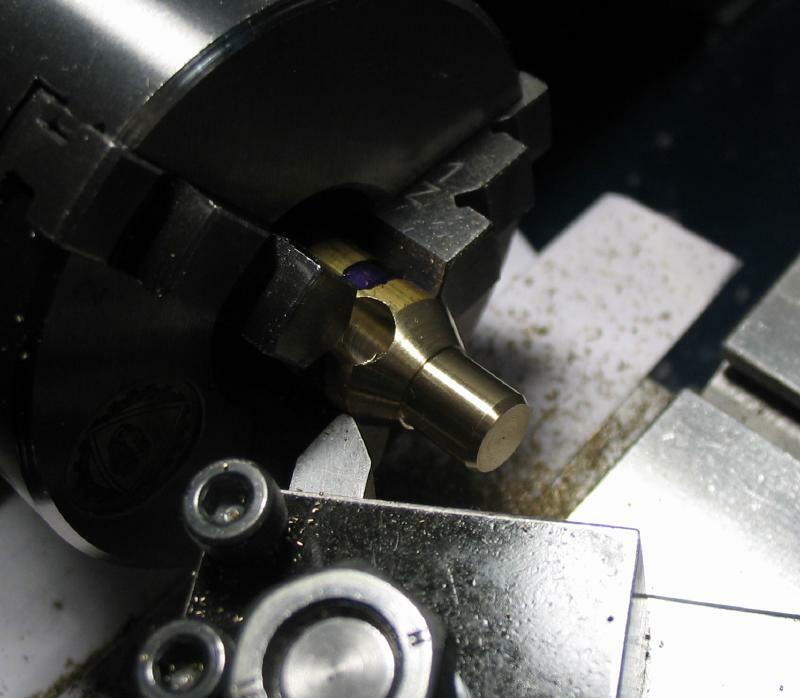 Not shown, but the rod was returned to the headstock and center drilled for reference for later. 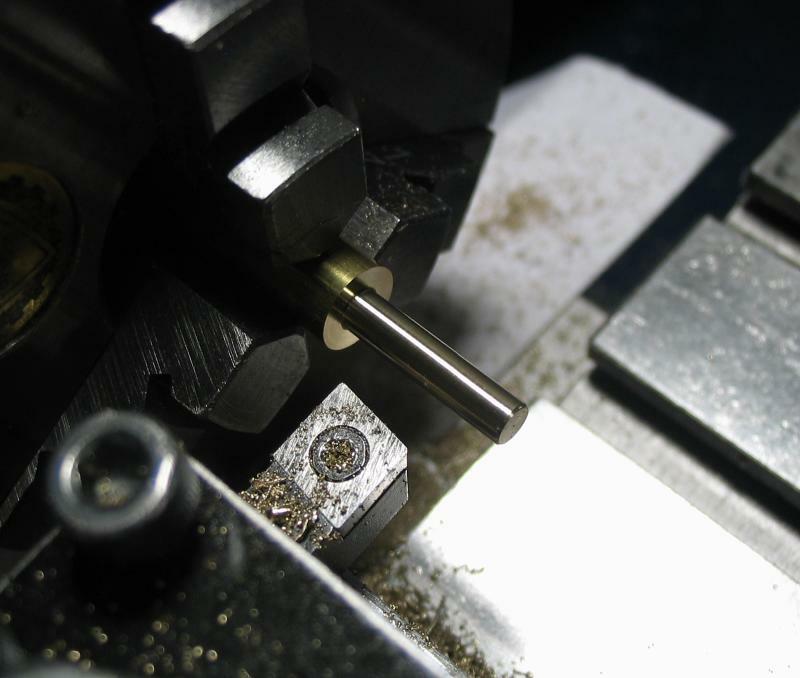 The rod was reversed in the chuck and turned to 7.5mm for about 6mm and then chamfered 30 degrees. 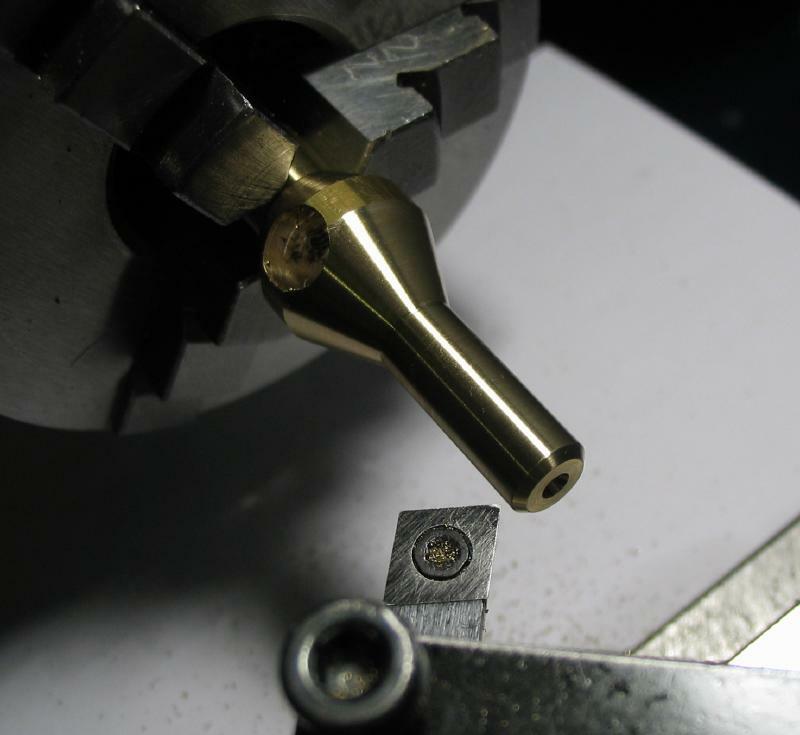 The end was spot drilled, drilled 2.5mm, tapped M3x0.5, and then countersunk. 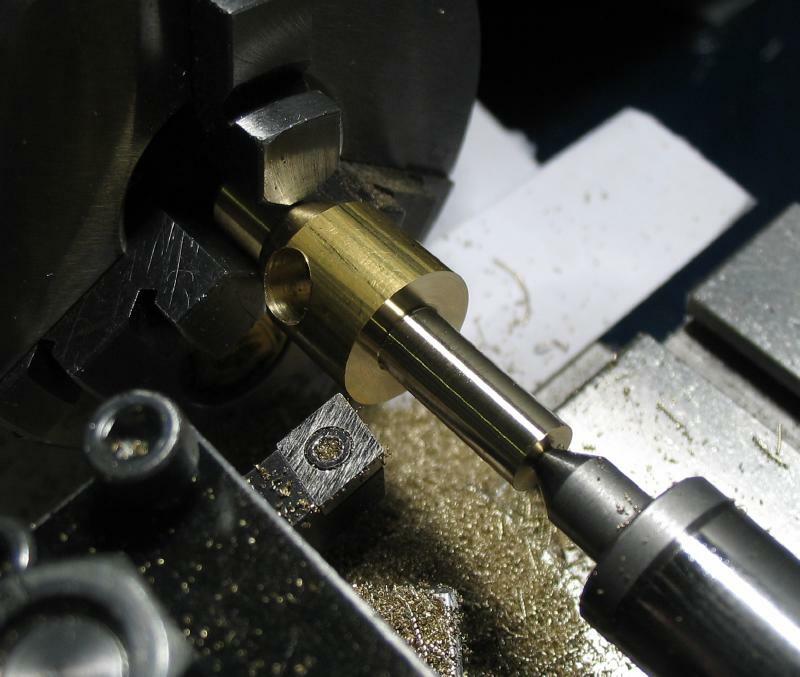 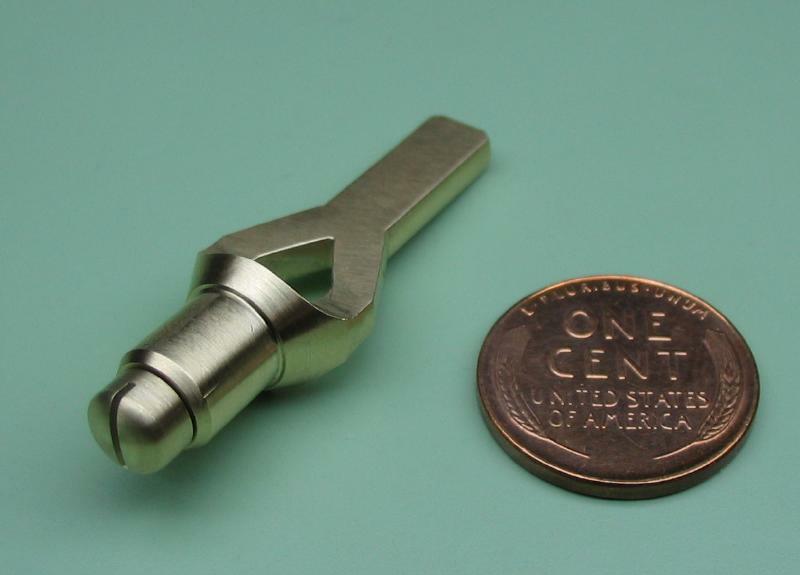 The rod was reversed again, and with tailstock center support, this end turned down to 6mm diameter for about 15mm, turned with a 25 degree taper, and the end lightly chamfered 45 degrees. 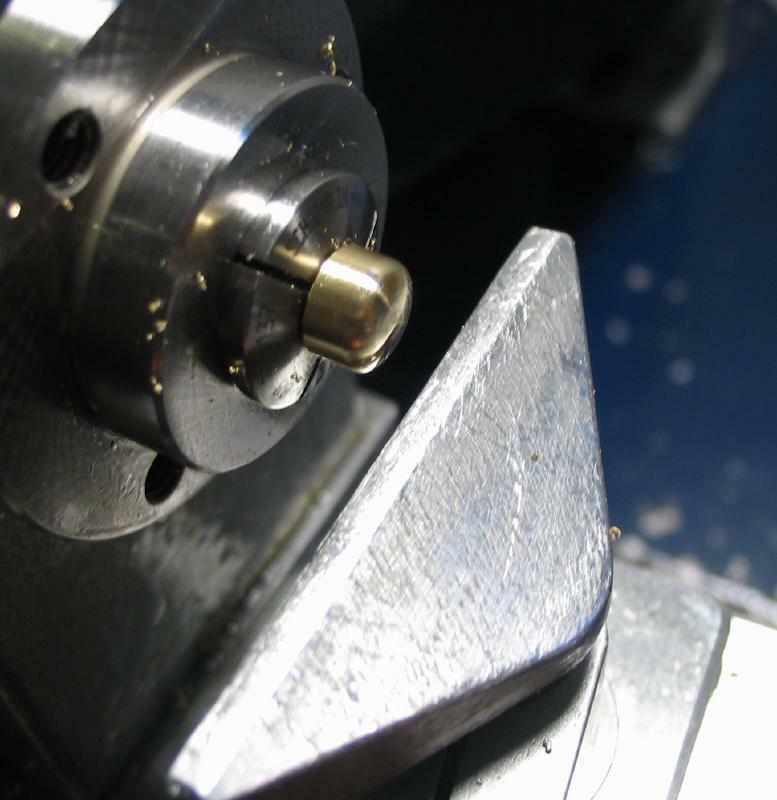 The work was moved into a collet and the dividing head mounted on the vertical slide. 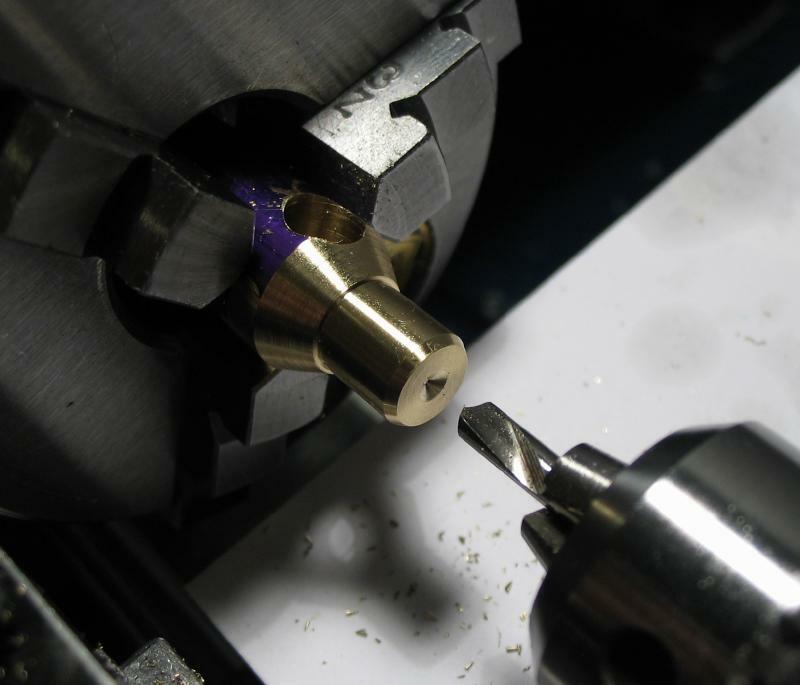 The opposing faces were milled flat, leaving the final thickness at 3mm. 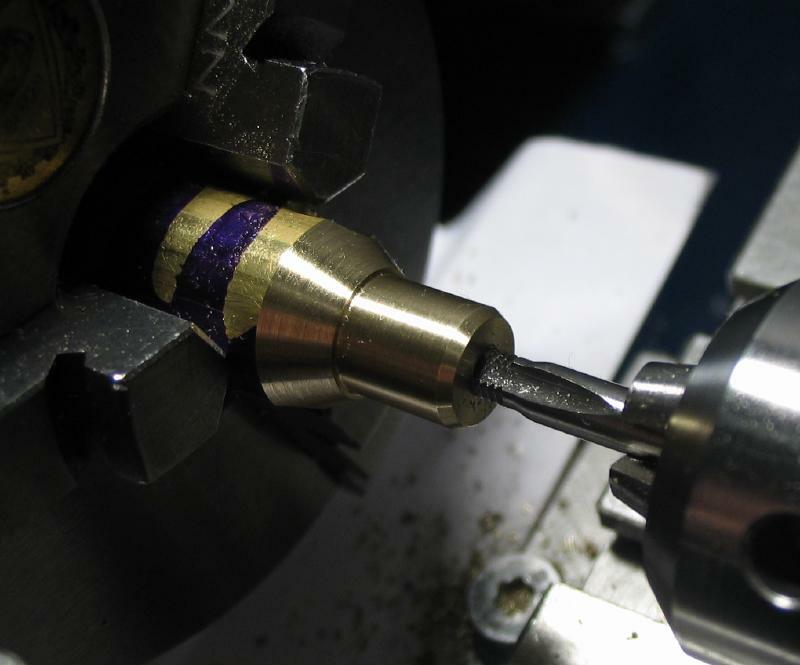 A 7mm ball end mill was used to radius the surface where the round and flat dimensions meet. 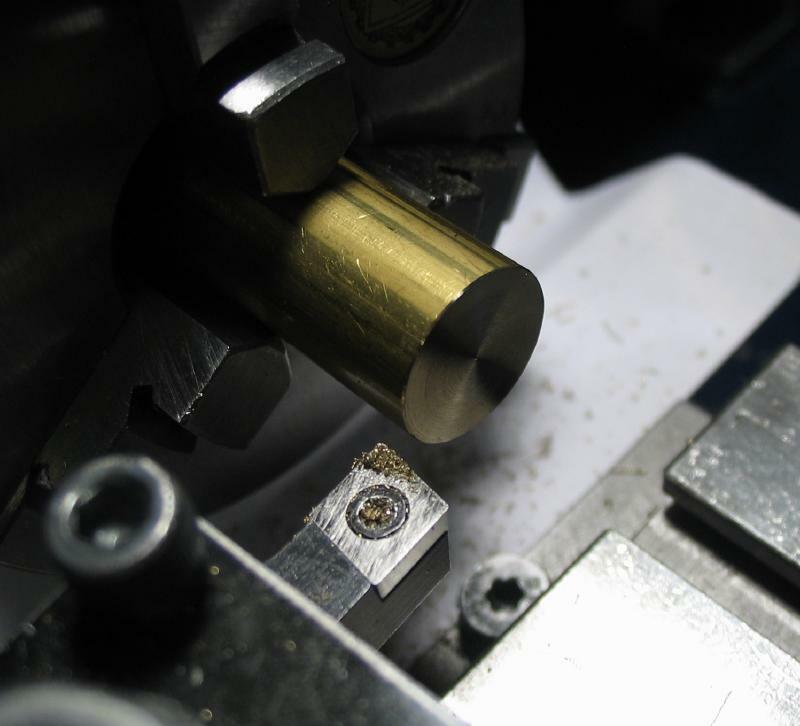 A small hole was drilled about 2mm below the 6mm hole, and these then connected with a jeweler's saw and finished with a triangular needle file. 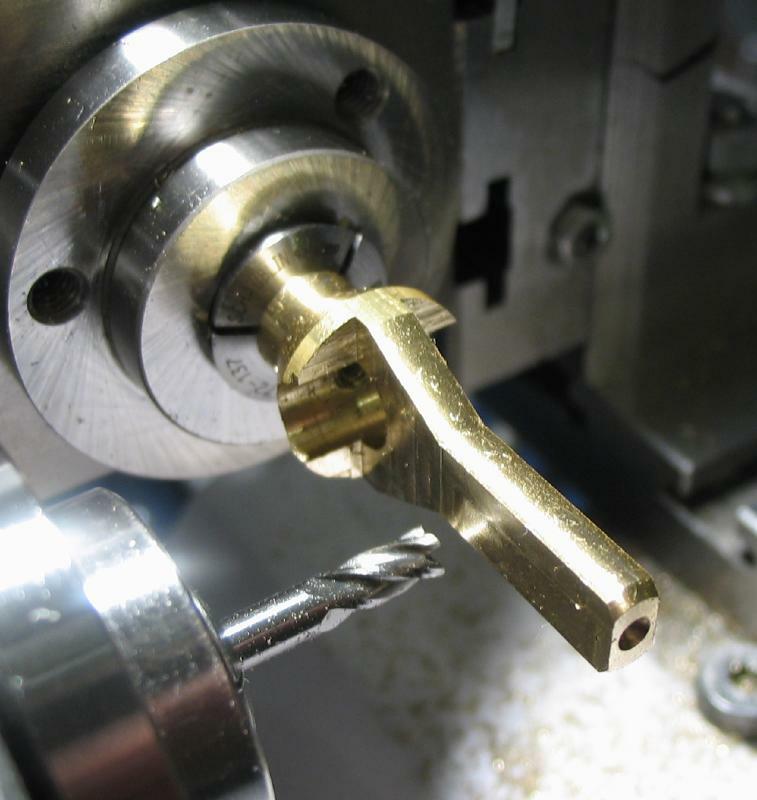 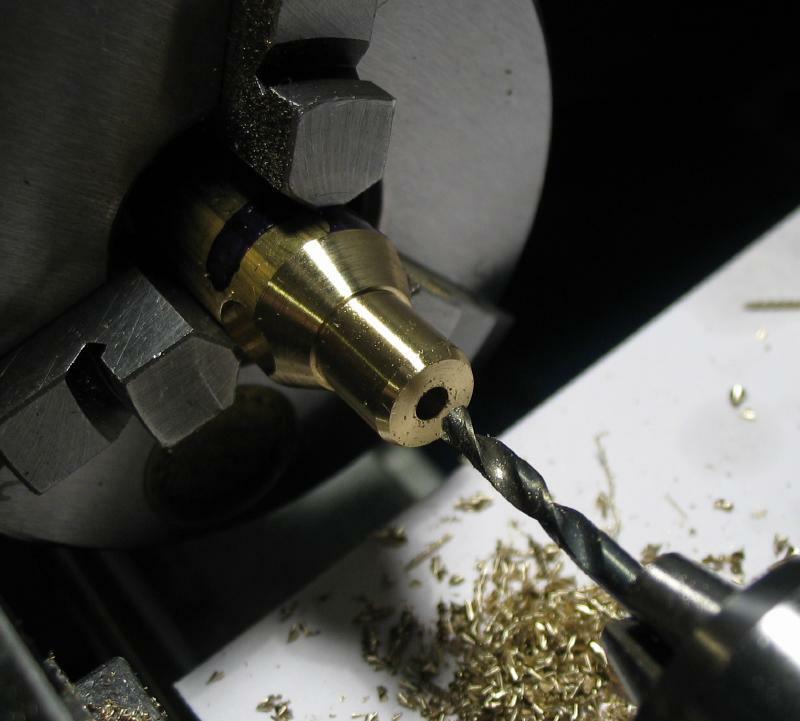 A screw was made from 1/4" brass rod. 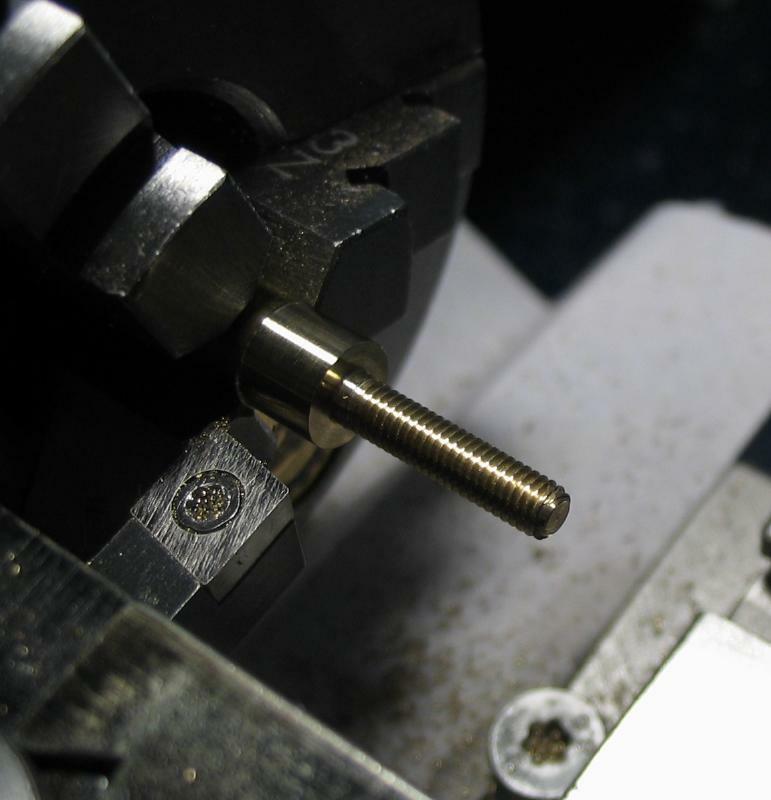 It was turned and threaded M3. 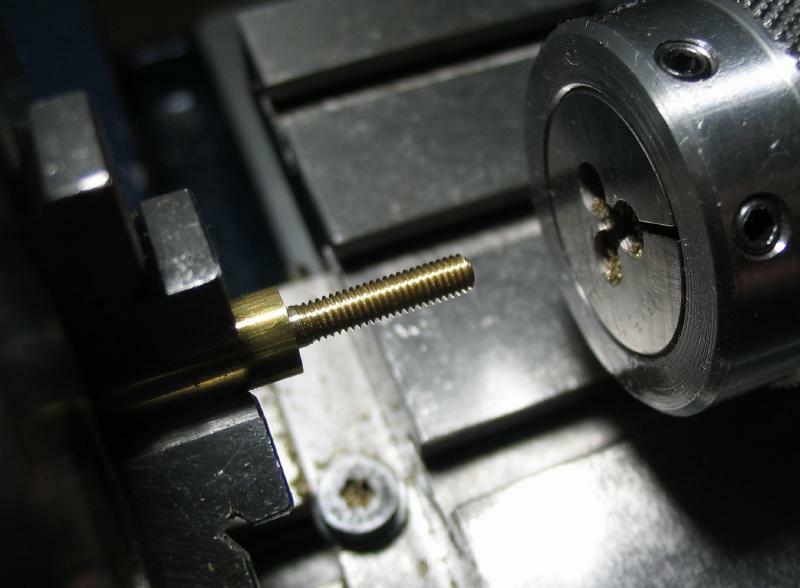 The screw head portion was turned to about 6mm diameter and then parted off. 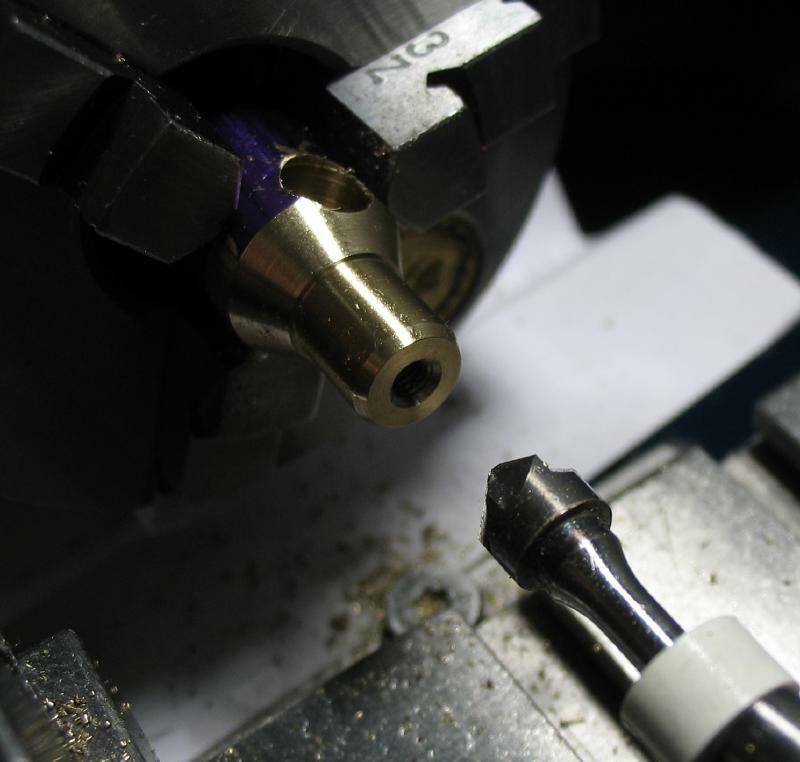 The screw was reversed into a collet and the top turned with a graver to round it over. 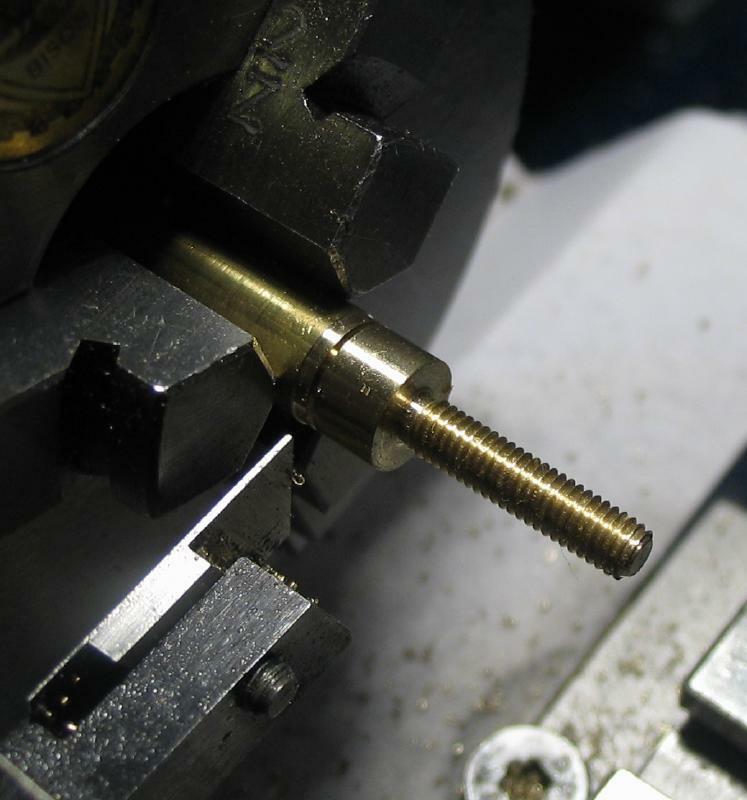 The screw was moved to the dividing head on the vertical slide and a 0.023" slotting saw used to the cut the slot. 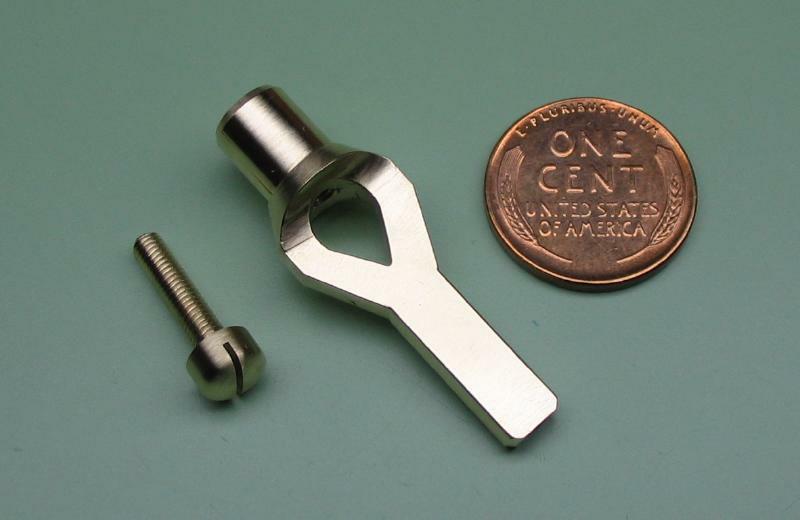 The parts after polishing up a bit.